Menulog delivers for Tikka Take so you'll be able to track your courier on a map. Roti wrap loaded with curried tikka skewers, fresh crunchy salad, grilled capsicum and onion topped with gourmet sauce. (GF) = Gluten Free, (VG) = Vegan and (N) Contains Nuts. Top quality saffron basmati rice served with a classic curry of your choice, papdum and side salad. (GF) = Gluten Free, (VG) = Vegan and (N) = Contains Nuts. Juicy tikka simmered in special biryani sauce, sandwiched between layers of spiced long-grained basmati rice, cooked to perfection and served with papadum and yoghurt dip (raita). (GF) = Gluten Free and (N) = Contains Nuts. 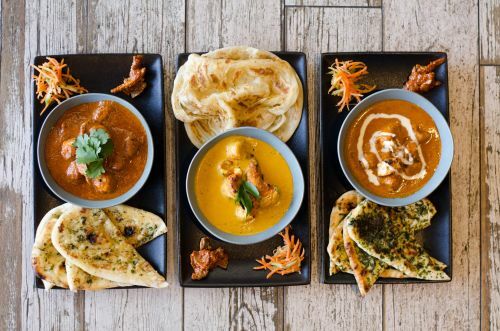 Two naan breads of the same style (or one cheese naan) served with your choice of classic curry bowl, pickle and salad on side. (VG) = Vegan and (N) = Contains Nuts. Fried peanuts mixed with herbs and spices and served with fresh tomato, onion, green chilli, corinader and lemon salsa. Coin shaped papadum topped with tomato, onion, cucumber salsa, special sauce and grated cheese. Coin shaped papadum topped with tomato, onion, cucumber salsa, herbs and spices. Jalapeno chilli stuffed with a mixtuyre of cheese, coriander and spices. Premium bite sized samosas stuffed with potato, green peas, herbs and spices. Premium bite-sized samosas stuffed with lentils, onion, herbs and spices. An irresistible platter of three original skewers served with mint sauce. Potato fries rolled in dried spices. Potato fries loaded with spicy chilli-garlic sauce, cheese and spring onion. Potato fries sauteed in special honey chilli sauce and garnished with sesame seeds. Potato fries loaded with mouth-watering butter chicken. Potato fries sauteed in schezwan sauce with spring vegetables. (VG) = Vegan and (N) Contains Nuts. Nine semolina flour hollow balls (puri), fried crisp and filled with a mixture of potato, black chickpeas, green chilli, coriander, dried masala and served with tangy mint spiced water (pani), sweet tamarind water, onion and masala. Nine puri served hot white pea curry, spiced water (pani), sweet water, onion and masala. Hot ragada and chutneys poured on crushed puri and papadi and topped with onion, tomato, green chilli, coriander and sev. Nine puri filled with potato masala, onion, chilled sweet yoghurt, sweet mango chutney, coriander chutney and garlic chutney, garnished with herbs, spices and sev. Nine flat puri topped with a mixture of potato, onion, tomato, sweet mango chutney, coriander chutney and spicy garlic chutney, garnished with sev, herbs and spices. Mixture (bhel) of puffed rice, peanuts, crunchy boondi, potato, tomato, onion and various chutneys, garnished with herbs and sev. Spicy bhel puri is loaded with shredded milk cheese. Crisp fried dough wafers (papadi), black chick peas, diced potatoes, diced onions, diced tomatoes, pomegranate and herbs and spices drizzled with an assortment of chutneys. Two samosas topped with chickpea curry, diced onions and diced tomatoes, drizzled wwith an assortment of chutneys and yoghurt, garnished with sev, herbs and spices. Fried green chilli fritter stuffed with special potato masala and drizzled with a medley of chutneys and sweet yoghurt. Three deep fried hollow dough balls partially filled with lentils, onion and sweet chutney, topped with spicy chutney, yoghurt, herbs and sev. Three lentil stuffed potato cakes with spiced chickpeas, onion and tomato, drizzled with a medley of chutneys and garnished with sev, herbs and spices. Two lentil doughnut (bhalla) soaked in thick sweet yoghurt (dahi) and topped with sweet chutney, pomegranate, herbs and spices. Combination of dahi bhalla and papadi chaat, drizzled with sweet and coriander chutney. One basket of 50 x Puri, 1 x Bowl of potato and chickpeas mixture and 1 x Jug of sweet and spicy flavoured water, served with black masala and onion. One basket of 50 x Puri, 1 x Hot pot of ragada and 1 x Jug of spiced and sweet flavoured water served with black masala and onion. All South Indian streets dishes are served with sambhar (lentil soup) and chutneys. Please note: Uttapam takes a little longer to cook than Dosa. Rice and urad flour crepe. Dosa stuffed with traditional spiced potato and onion mash. Dosa stuffed and topped with loads of cheese. Dosa stuffed with cheese, onion and chilli. Dosa layered with spicy mysore masala and stuffed with spiced potato and onion mash. Open thick dosa layered with sweet and spicy pizza sauce, topped with mixed vegetable and loaded with cheese. Dosa stuffed with minced paneer and garlic masala. Dosa layered with spicy garlic chutney and stuffed with spiced potato masala, spring vegetables and cheese. Rice and urad flour thick pancake (uttapam) topped with onion, herbs and spices. Uttapam topped with tomato, herbs and spices. Uttapam topped with cheese, herbs and spices. Uttapam topped with onion, tomato, carrot, capsicum, red cabbage, herbs and spices. Uttapam layered with spicy mysore masala and mixed vegetables. Uttapam topped with onion, chilli, cheese, herbs and spices. Uttapam topped with shredded coconut, onion, chilli, herbs and spices. Mixed variety of uttapam (onion uttapam, chilli uttapam and mixed vegetable uttapam). Round, fluffy and savoury steamed rice cake. Urad dal doughnut mixed with herbs and spices. Bread bun (pav) roasted in butter with special dry chilli and garlic masala and filled with hot potato bonda (vada) and coriander chutney. Bread bun (pav) rolled in special dry chilli and garlic masala and filled with hot potato bonda (vada), coriander chutney and green chilli. Potato bonda (vada) served in a bread bun (pav) and toasted in butter with spicy dry garlic chutney and loaded with cheese. Dabeli is an Indian burger filled with a spicy potato mixture, onion, pomegrenate, sweet and spicy chutney, masala peanuts, toasted in butter and topped with sev. Dabeli loaded with extra chutney and lots of cheese. A samosa served in a bread bun (pav), smeared in spicy dry garlic chutney and accompanied by three chutneys. Vegetable puff topped with spicy chutneys, chilli, onion and cheese. Pav bhaji is the most famous street food in India, consisting of a thick vegetable curry (bhaji) and served with a soft bread buns (pav). Pav bhaji topped with garlic chutney and cheese. Bhaji served between a spiced bread bun and topped with onion, herbs and spices. Bhaji served between a spiced bread bun and topped with cheese, onion, herbs and spices. This famous spicy Mumbai curry made from sprouted moth beans and served with bread buns (pav), topped with spicy authentic bhujiya mix. Delicious Indian-style stir fry of rice and vegetables served with raita and papadum. Tawa pulao is packed with paneer and spiced with pav bhaji masala and served with raita and papadum. Spicy curry made from white chickpeas (chole) served with super soft Indian pita bread. Spicy chickpea (chole) curry served with fried leavened breads (bhature). Spicy mixed lentil curry (dal) served along hard wheat rolls (baati), accompanied by chutneys. A popular traditional meal of fried puffed wheat bread, classic potato curry, mango pulp, papadum and pickle. Indian flat breads stuffed with a variety of fillings, baked on a flat top and then finished with shallow frying in butter and accompanied with yoghurt dip (raita), pickle and onion. The most famous type of sandwiches served on the streets of India. Full of flavour, addictive and super tasty! Vegan option available upon request. Simple and delicious sandwich filled with a medley of potato, tomato, cucumber, capsicum, onion and chutney. Simple and delicious grilled sandwich filled with a medley of potato, tomato, cucumber, capsicum, onion and chutney. Three layers of bread filled with potato, tomato, cucumber, capsicum, onion, cheese and chutney. Sandwich stuffed with a sumptous samosa and irresistible chutney. Sandwich loaded with shredded milk cheese and sprinkled with masala. Sandwich loaded with shredded milk cheese and chutney. Three layers of bread with fresh vegetables, aloo mutter mix and cheese. Three layers of bread with capsicum, onion, green chilli, coriander chutney, herbs and spices. Three layers of bread with a pineapple slice, pineapple jam and freshly shredded milk cheese. Three layers of bread with chocolate Nutella, ice cream and freshly shredded milk cheese. Similar to a dumpling or dim sum. Momos are a famous street food in Nepal, Tibet, Bhutan and Delhi. A popular fusion recipe of bhel made using crispy deep fried noodles and spring vegetables, cooked in a special sweet and spicy. Deep-fried spicy paste coated gobi (cauliflower cubes), cooked in tangy and spice yet irresistible traditional 65 sauce with onion and capsicum. Irresistible deep-fried spicy paste coated gobi (cauliflower cubes) sprinkled with seasoned masala and cooked in special chilli sauce. Deep-fried spring vegetable balls sauteed in a special brown sauce. Deep-fried spring vegetable balls in a special gravy. Vegetable stir-fry with boi9led medium noodles in special sauce. Stir-fried rice with vegetables in schezwan sauce. Vegetable stir fry with boiled medium noodles in schezwan sauce. Vegetable stir-fry with boiled vermicelli (thin) noodles in special sauce. Stir-fried rice with vegetables in special sauce. Warm melt-in-your-mouth soft fried dumplings (jamun) soaked in a lightly rose (gulab) flavoured sugar syrup. Special gulab jamun stuffed with mixed nuts and soaked in sugar syrup. Chilled cottage cheese dumplings (malai) soaked in a sweet cream syrup (ras), delicately flavoured with cardamom and garnished with nuts. Warm, sweet and slow cooked carrot pudding, flavoured with nuts, saffron, nutmeg and cardamom. Chilled sweet hung-strained yoghurt, flavoured with cardamom, saffron and pistachio. Soft and spongy cottage cheese dumplings dunked in super rich saffron flavoured thickened milk and loads of dry fruits.